Nine Inch Nails lead the bill for Louder Than Life's biggest event yet. The fifth annual festival, held in Louisville, KY, expands to three days for the first time ever — September 28, 29 & 30 — at Champions Park. Look for the full lineup to be announced Monday, June 4. The band has released eight studio albums to wide critical acclaim, including the multi-platinum Pretty Hate Machine (1989), the uncompromising seminal album The Downward Spiral (1994), and With Teeth (2005), which hit Number One on the US Billboard 200. They have won two Grammys for Best Metal Performance and sold more than 30 million records worldwide, with hit singles including "The Hand That Feeds," "Only," "Every Day Is Exactly the Same" and "Survivalism." 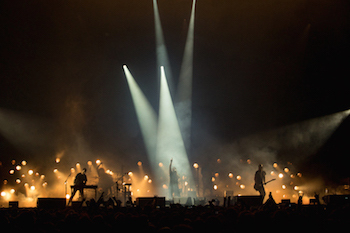 Nine Inch Nails bring their incendiary live experience, hailed by the New York Times as a "musical, visual, emotional sensory onslaught," to Louder Than Life, which is held the weekend of September 28-30, 2018.